Adhere the parquet tile to the subfloor using WAKOL D3540 cork flooring adhesive applied as a two-part contact glue (apply a coat of the adhesive to the subfloor as well as to the back of the parquet tiles). We recommend using the Loba microfibre roller for best coverage results. The back of the tiles can be coated in advance (max 24 hours) but the SUBSTRATE must be coated at the time of installation. The adhesive should be allowed to dry until it appears clear, dry to the touch and slightly glossy. You want full coverage NO DULL SPOTS. This will provide the strongest bond. The responsibility of the suitability of the adhesive to each individual case cannot be assumed as the manufacturer has no influence on the proper application of the adhesives by the installer and or contractor. The directions for use were established on the basis of research, experiences and tests believed reliable. Any liability on the part of the seller cannot be derived there from verbal information is subject to written confirmation. Open cartons must be at job site for a minimum of 48-72 hours or as needed prior to installation. During storage and installation, maintain temperature and relative humidity to level consistent to conditions that will prevail when building is occupied. With improper acclimation, the floor could expand or contract after installation. Rooms and sub-floor temperature should be between 65-85°F. All surfaces shall be dry, smooth and level. They must be structurally sound, solid, well fastened clean and free from dust, oil and grease, paint, wax, old adhesives. Check for curing and parting compounds, surface hardeners and sealers which are known to interfere with the adhesive bond to concrete, as well as loosely bonded toppings, primers or any other deleterious substances that may prevent or reduce adhesion. Prior to the installation check any subfloor properly according to NWFA guidelines. Any irregularities of the subfloors may telegraph through the cork flooring; make sure the subfloor is evenly smooth and level. New concrete floors should be constructed, finished and cured (minimum 30 – 60 days) in accordance with the American Concrete Institute (ACI) 302 “Guide for Concrete Floor and Slab Construction” (Class 2 or 4) with a minimum compressive strength of 3,500 PSI (246 kg /cm2). Before starting installation on concrete subfloors, moisture test must be conducted. The Anhydrous Calcium KIT (calcium-chloride) has been designed to produce qualitative and quantitative results. 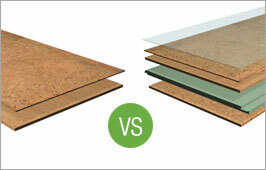 Emissions of moisture through the subfloor should not exceed 3 pounds /1,000 sq. ft. / 24 hours (1,36 kg/93m2/ 24 hours). Alkali salts can be carried to the surface of concrete subfloors during the curing or where excessive moisture conditions exist. These deposits can create adhesive bond failures. The suitability of the slab can be determined with the use of pH testing paper or sticks. It is suitable to install the flooring if the pH is under 10. Preferred underlayments such as plywood, particle board with 40 lb. per cu. Ft. density, and OSB (oriented strand board) should have the APA trademark and be recommended or guaranteed by the underlayment manufacturer or the wood flooring’s manufacturer. The subfloor over which the underlayment will be installed must be smooth, dry properly fastened and free of joint swelling, warping or delamination, multiply and tecply underlayments have been approved as is APA-AC/BC EXTERIOR. Existing cement terrazzo and cement tiles must have full adhesion to the subfloor. Remove all residues of maintenance agents and other materials that may deteriorate a good adhesion. Prime any non porous subfloors with prime WAKOL D 3073 and level with a high quality cement based underlayment in a minimum thickness pf 3/32. An even surface is necessary plaster must be leveled with fine, high quality wall filler. To bond dust use WAKOL D 3073 Universal Primer diluted 1:2 with water. Minimum drying time of 24 hours is needed. 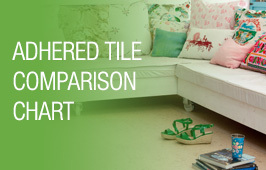 APC Cork tiles are only compatible with hot water radiant heating systems. Do not install cork tiles over electric radiant heating systems. Floating floors tend to expand and contract as a unit and therefore are recommended when in use with radiant heating systems. Cork parquet tiles can be installed as long as the consumer understands that gaps between parquet tiles could be visible during heating seasons. Prior to installation you will need to turn the system on, regardless of the time of year, for 4-5 days. Maximum surface temperature should never exceed 85°F. For best results lay tiles with staggered joints. Mix tiles from various cartons to maintain natural variation of color and pattern Allow 1/4″ expansion space between finished floor and all walls, thresholds, water pipes, and other vertical surfaces. Use silicone sealer near bathtubs, commodes, etc. When moisture level in the environment is low, parquet tiles should not be positioned too tightly against one another. When moisture level is high, tiles should be installed tightly. Stir adhesive well before use. Spread adhesive evenly and uniformly on the back of the tile and the subfloor using the recommended roller. The tiles can be coated and allowed to dry in advance (maximum 24 hours before installation), however the substrate must be coated at the time of installation, be sure that tiles and subfloor are completely covered. Allow to dry until the adhesive is clear, dry to the touch and slightly glossy. If you are unsure about the coverage a second coat may be applied once the first coat is dry. Clean tools and equipment with water before adhesive cures. Do not use adhesive below grade with excessive moisture or hydrostatic pressure. Acclimatize materials during cold period properly. Do not use WAKOL D 3540 for vinyl cork flooring. If you choose to install cork tiles in a kitchen or high traffic area, you may opt to re coat the floor with a polyurethane to prevent dirt and liquid spills from penetrating through the joints; the use of such is a discretionary option. 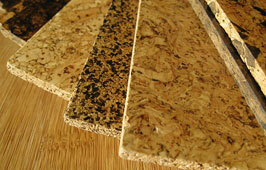 For any commerical applicaton of cork tiles the floor must be sealed after the installation. We recommend Bona Kemi Traffic with an application of 2 coats depending on the amount of traffic. Sweep and/or vacuum floor regularly. Never saturate floor with water when mopping. Damp mop (only) floors as needed. Use wide casters or felt tips under legs of furniture. 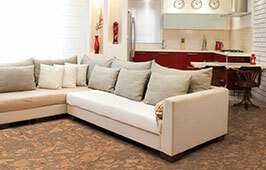 Cork flooring, like wood floor, will fade if exposed to direct sunlight for prolonged periods of time. The use of drapes or other systems is recommended to protect the floor. PLEASE NOTE that pre-finished polyurethane tile have a characteristic known as “fullness” which appears around the perimeter of the tile. It creates a slight rise along the seams, even though the tiles join flush and squarely with one another. “Fullness” occurs because cork is a natural product that absorbs and emits moisture on the surface that are unfinished (tile edges). It is not considered a defect in materials. Once installed, application of polyurethane on entire floor may reduce “fullness” effect.